By Jessica Hardin | March 20, 2019 at 12:01a.m. Poland has been the stomping ground of influential women since the community’s inception. 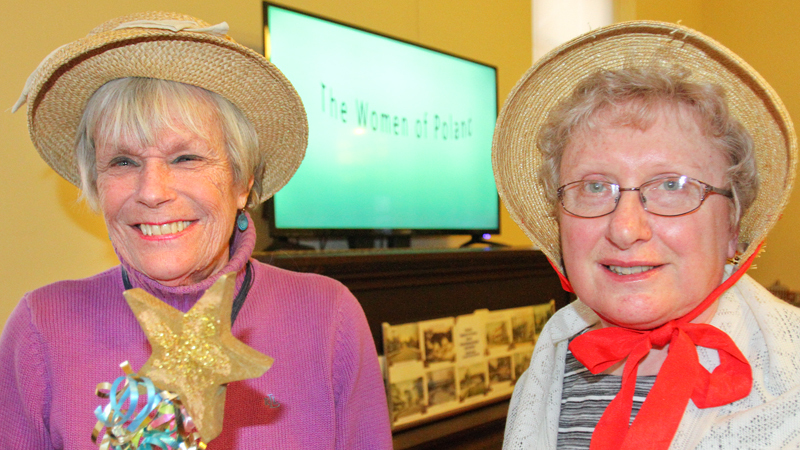 Poland Historical Society conveyed that message through the program Women of Poland, which took place at the Little Red Schoolhouse on Tuesday evening, during Women's History Month. The presentations featured some of the community’s “firsts” by women, such as the township’s first female trustee, Connie Coloutes, and the village’s first elected female mayor, Ruth Zimmer Wilkes Harshman. On Feb. 16, 1800, Lydia Kirkland Fowler Dunlap give birth to the first baby girl born in Poland. Her family is buried in the graveyard adjacent to Poland Presbyterian Church. Debbie Gilbert, portraying Dunlap, entreated the audience to take part in a graveyard tour this summer. “We’re dying for you to come for a visit,” Gilbert quipped. Monday night’s presentations included several famous women who lived in Poland. The mother of President William McKinley, Nancy Allison McKinley, lived in Poland before moving to Canton. Called “Mother McKinley,” Nancy was known as a good neighbor, said Carla Davanzo. She notably shared her candle mold and collection of articles with members of her community. Famed muckraker Ida Tarbell moved to Poland after completing her studies at Allegheny College. She taught at Poland Union Seminary and eventually left the town, because “the town questioned her teaching methods,” said Kitty Heineman. Tarbell went on to uncover the corrupt business practices of oil tycoon John D. Rockefeller. The program also provided time for the audience to add to the list. Poland Historical Society Treasurer Dave Smith mentioned Rebecca Rogers, an architectural preservationist, who is responsible for the addition of several Poland sites to the National Registry of Historic Places. Additional resources are available at the Little Red Schoolhouse for those who wish to learn more about the lives of women of Poland. March 19, 2019 10:55 p.m.
June 11, 2014 5:38 a.m.
August 5, 2016 8:54 a.m.